This tutorial is based on Ti SDK 3.0.0, which is outdated. I have a new blog post based on Ti SDK 3.1.3GA using GCM. We can achieve Push Notification in Titanium using Appcelerator Cloud Service in 5 steps. Before subscribe for Push Notification, cloud user should logged in. Cool.., You have completed Android Push Notification setup(Here is the whole sample code). This time for testing, run the application in android device and click the button "Android Cloud Push Notification". You will get 3 alerts continuously. Very useful post! Thank you. By Following these steps I had successfully implemented ACS with android. Best thanks for this tutorial ! But i have a force close when i pushed an alert normal ? Hi Nicolas, Thanks for reading my blog. Did you able to receive notification on your device?, When your app getting crashed(give me more info)? Thanks for this useful tutorial I have succeeded installing ACS with my android application for the first time but when i have uninstall the app and later i have installed it again i am not able anymore to receive notifications. So what i have to do to be able to receive notification if the user uninstall the app and then install it later. Hi! This post is very helpful to get my ACS push notification setup and ready. Here's the problem I faced: it shows "You currently have 1 iOS client, 1 Android client subscribed to push notifications." on my appcelerator account via my.appcelerator.com. However, when I send the push notification, only my that android device never receive it. (My iPhone is able to receive the pushes). Anybody got this problem as well? Hi Karthi! Thank you for your response! Yes, I've followed all the steps for android. On my.appcelerator.com, my ACS push notification registered the Android device that I have! Is there any other step that I might miss? 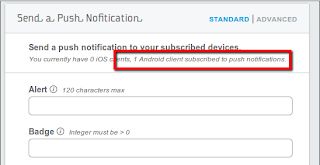 I've reached your step 5 and can see "1 Android clients subscribed to push notifications". But still, I can't see the notifications! Hi Karthi, I found the source of the problem. I should not have followed the instructions in the https://cloud.appcelerator.com/docs/android#push first before following yours. I changed the AndroidManifest.xml when I should not! hi Karthy will the ACS work on the production environment correctly. and how to give access for the Admin Application to let him send notifications without the need of my help. 1) Create a separate Appcelerator account for your client(Admin) and create a new app(use this cloud credential for your existing application). So that admin can send notification without your help. 2) Build a web interface for admin using REST api (http://cloud.appcelerator.com/docs/api/v1/push_notifications/notify), which is provided by Appcelerator. I think you haven't logged in with cloud user. To send the push notification,cloud user must be logged in. Before subscribing for push notification, you need to login to app as a valid app user. Hi Jeff, Thanks for reading my blog. 1. Created a new Titanium mobile project with cloud integration. 3. Used the app.js provided by you. Changed the userId and passwrd to the created user. Hi Jeff, Everything seems okay. Except below one. I suspect this may be an issue(am not sure). So make sure your app id is "com.push.pushtest" in your "tiapp.xml"
Have you a url or maybe its not free ? "ti.cloudpush" is the inbuild module with titanium sdk (Titanium >2.0). "ti.cloudpush" is used for Android push notification. So you no need to download it separately. It comes along with your Titanium sdk.Just add require('ti.cloudpush'); in your code to use this module. first all, thx for answer me. It woks ! i mean , i have my device token, after im in step 3 and i created my user on my manage ACS, but i have error after compiled. You declare var cloudPush and its work fine but after for step 3 i have message reference Error, "cloud" is not defined. So i changed Cloud.Users by CloudPush.Users but i have a message error, users is not defined. Im sorry to disturb you :) can you help me ? Last question, so if i wanna integrate this module to an application for android market. The best way is to call function defaultSubscribe directly in CloudPush.retrieveDeviceToken() in success ? It will add my client directly in my manage ACS ? it works fine on my simulator, and receive push perfectly. I wanted to install my test app on my device. Any idea on this pls ? i copy and paste your code, and changed the default user, and charge on my device, i have the same error. Thank you for this tutorial. There are a few things that are not entirely clear to me so I hope you will be able to help. b. When one sends out a push progammatically it is easy to send out a notification where you specify the channel. However, it is not clear to me how I do this from the ACS control panel where the options offered are title, alert etc. Hi Atul, Thanks for reading my blog. b)go to My Apps -> Manage ACS -> DEVELOPMENT -> Push Notifications, here you can find options like alert, title, badge...etc. Then hit the button "Send Push Notification" instantly you will receive notification. 1. Compared to Sencha Touch 2.0 how would you rate Titanium UI creation,look n feel...i am doing RnD on both technologies to choose one which suits my requiremnts and would like your opinion. For eg one of the req that is to display a nested tree list in one window which will display the child elements when i click on them as a collapsable view. 2. Is UI designing on titanium a bit more complex since it uses the native controls than in sencha where we can use css to stylize the contrls. 3. Can we use APN and Google cloud to send push notification to the device. If possible could u please provide with links. I have a req to create a hybrid application using either sencha touch/phonegap or titanium. Hi Jeff, I haven't used Sencha Touch yet, without using I cant able to compare it with Titanium. It was good tutorial for push notification implementation.But I have done all the steps told by you(in appcelerator site as well as steps like appId creation and mapping). Whwn i launch the app and click "Register for Puh Notification", I got three alerts, Device Token :'some xyz' ,Subscribed for push Notification and Login success. Even though i got all those, My push console says, "You currently have 0 iOS clients, 0 Android clients subscribed to push notifications". Since no subscription in console, i am unable to receive notification. Please give your thoughts . Question: Can a person receive push notifications on Android phone if the application is not running? Thank you for the above tutorial and example code. It was VERY helpful!! Yes, even If the application is not running user can receive the push notification. Hi, im trying to follow the steps in your tutorial, i already added the module in tiapp.xml, but im failing at step 2, when i try to retrieve the device token im getting this error: "Failed to register for push! com.appcelerator.cloud.push.PushServiceException: Invalid toek request, Message: Unable to generate device token", could you please give me any help with this?, seems like im missing something but i just cant find the problem, thanks! Thanks for the reply! I tried to completely kill my test app by going to task manager and completely killing the app, but when I do I never get any push messages. If someone completely kills the app, should I still get push messages? Or do I have to setup a background process to make push messaging work if someone completely kills the app? Hi Shanuka, Thanks for reading my blog. Yes, you can send push notification to specific client(user). For that you have to use "to_ids" property. to_ids - Comma separated user ids. Send push notification to the specified users who subscribed to the specified channel. When a user clicks on a push notification from their android device shouldn't the app launch? It does on the iPhone. What am I doing wrong? I have a problem, when I want to get the devicetoken, I got a java.lang.nullpointerexception. Hmm, everything seems fine in terms of the messages showing up and the registered device showing up on ACS. However, I get nothing on the android device... is this not supposed to work on the android emulator? Mind you, I don't have an android device to test on. I tried using the code sample to mine, Did every step and finally I was able to see (1) Android device added on the push notification screen. (same as a screen shot on the blog). Then I tried sending the Notification through the test form provided by appcelerator. Wat can be wrong in this ? Having same issues: I follow the steps, but never see a notification on the android device. What's going on? I tried to completely kill my test app by going to task manager and completely killing the app, but when I do I never get any push messages. If someone completely kills the app, should I still get push messages? Or do I have to setup a background process to make push messaging work if someone completely kills the app? Thats how you defined it - "Push notification allows an app to notify you of new messages or events without the need to actually open the application"
But the push message is received only if the app is running. I have the same Issue... :( Please suggest. Hi Im getting This Error :Failed to register for push! com.appcelerator.cloud.push.PushServiceException: Invalid token request. Message:Proper Android Config can not be found, please provide a valid packagename. It works like a charm. Guys, just follow the tutorial carefully! Hi, I got the messages but don't see 1 Android clients subscribed to push notifications.. help? If i change it to titanium 2.1.0, it crashes..any idea? How to get notifications when new blog topics has been updated ? Thomas where you put this line in the code ??? I'm working on it but cant see any notification on my device but successfully registered !! CAn you please share your code with us ?? my question is : Is it possible to build a custom web application that will do the push notification with the use of Titanium api of course. im getting device token alert, and it goes to login function, after tat no alerts received. it doesnt enter success function. Hi, I am getting same error like "com.appcelerator.cloud.push.PushServiceException: Invalid token request. Message:Proper Android Config can not be found, please provide a valid packagename.". Have you find solution of this? We have a similar problem as other people, All works fine if the app is running but if we kill the app and send a notification we dont have any response till we open the app again. I wonder what should I follow to implement push notifications in the production mode not the development mode. please give me some hints. A simple note for readers, check the source code in github, it is more correct/complete than the snippets in the post. Can we test push notification service on Android Emulator so that emulator can show notification message? CloudPush.enabled = true; does not always work. Always make sure to call CloudPush.enabled = true; And do so AFTER fetching the device token (so in the success method would be a good place). Neglecting this could cause problems when going into production (our simulator didn't give us any trouble). Any chance we get an updated version for 3.1.3GA? It's not receiving notifications at this moment. By Monday(7th of October), I will update this post with Ti SDK 3.1.3 GA. Thanks, I do appreciate your help not only with this but all the content hosted here. 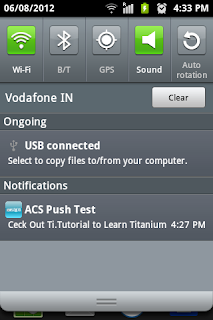 Cleison, I have done ACS push notification in Ti SDK 3.1.3GA(using GCM). I will update this post by tomorrow. it showing error device token should have length 23 characters. I've put the sound, icon files in the directory as you said but the response from Ti console is "CloudpushModule: (main) [46057,116137] Failed to find icon resource 'appicon.png' in application"
And getting this error in console, Can you help to resolve this? I have a problem with Ti SDK 3.4.0 GA. I didn't receive push notifications when I close android app on device. Anyone how know solution for this problem? hi every one i am getting the error some times "no subscription found" and some time failed to authenticate user.